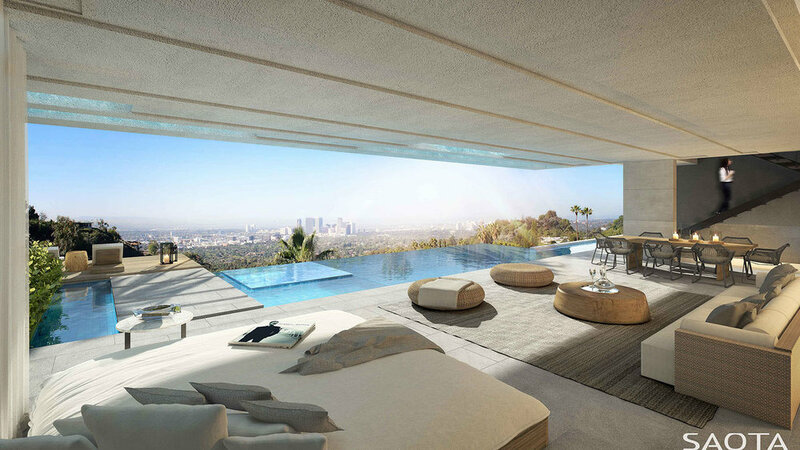 PECK ARCHITECTURE took on the role of Architect of Record for a project that had been previously permitted by the City of Beverly Hills under a different design. SAOTA and PECK ARCHITECTURE came to the project as a team. PECK ARCHITECTURE has taken the project through three sequential permit revisions scheduled during construction so that foundation excavations and construction could progress during the design process. This fast track permitting and construction strategy involves a high level of risk and is schedule driven. By working closely with the general contractor and the permit expediters at Crest Real Estate, PECK has succeeded in achieving the permitting required, on schedule as construction has been underway. The project makes use of a central courtyard design which is an effective way of enlivening projects with tight boundaries and large basement areas. The design scheme includes a main kitchen, back of house Kitchen, two master suites, a vault, a cigar lounge, as well as multiple bedroom suites and central living and dining spaces. A water feature spills from the front yard to the central court at the basement level. Upper and lower level pools have been included in the design.